Andipa Gallery presents an exhibition of 20 original works on canvas, pallet and steel by the UK's leading urban artist, Banksy, including the largest canvas to become available, measuring fourteen feet in length. Andipa was the first gallery to put on a major exhibition of Banksy's work in the secondary market, showcasing one of the largest collections of the artist's work. Over 25,000 people visited the gallery during the exhibition in 2008 to view one of the most extensive private surveys of the artist's work brought together in recent years. "Banksy continues to defy the establishment with poignant commentary through his street work. He continues to evolve and adapt as an artist, as we saw with his response to the New Orleans anniversary and his New York Village Pet Store creations last year. He's always one step ahead of the game, reasserting freedom of speech through both his street and his studio works." 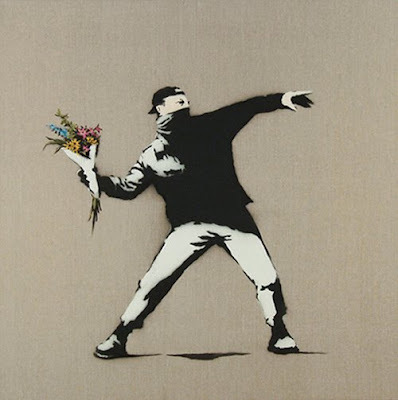 Please Note: Andipa Gallery does not represent Banksy. This is an independent exhibition and the artist is not involved.